Grape juice and grape jellies and jams are long-time favorites of children and adults alike. America’s favorite grape juice and grape jelly come from Concord grapes. Now, let’s explore how the Concord grape, and both grape juice and grape jelly, first came to be. 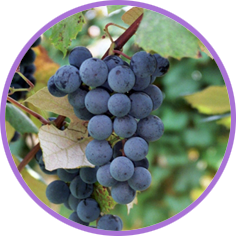 FROM SEEDS: Although commercial grape production dates back to the year 1000 B.C., it was not until 1854 that the Concord variety made its debut, appropriately named after the Massachusetts village of Concord where the first of its variety was grown. The Concord grape is a robust and aromatic grape whose ancestors were wild native species found growing in the rugged New England soil. TO JUICE: The first unfermented grape juice known to be processed in the United States was by a Vineland, New Jersey dentist, Dr. Thomas Welch in 1869. Dr. Welch, his wife and 17-year old son, Charles, gathered 40 pounds of Concord grapes from the trellis in front of their house. In their kitchen, they cooked the grapes for a few minutes, squeezed the juice out through cloth bags, and poured the world’s first processed fresh fruit juice into twelve quart bottles on the kitchen table. Charles Welch transferred the juice operations to Watkins Glen, New York in 1896, and the following year to Westfield, New York. He processed 300 tons of grapes in 1897. AND JAM: While jam-like products have been around for centuries, Welch’s created modern jam in 1918 for World War I rations, calling it “Grapelade.” The Army bought Welch’s entire first production run and returning doughboys demanded it when they got back home. Welch’s launched retail grape jam in 1923. Jam is successful because it has the great Concord grape taste, but water has been removed so it will not spoil under normal circumstances. Grape continues to be a favorite flavor of jam/jelly. AND THE PB & J: Three products came together in World War II to create the lunch classic, the peanut butter and jelly sandwich. Welch’s invented Grapelade in 1918. The next major product improvement was bagged, pre-sliced bread, created in 1928. The last product came from the need to get U.S. soldiers more protein during World War II. Inexpensive but nutritious, peanuts were ground into a smooth, buttery consistency, canned, and put into soldier’s rations. Somewhere, someone mixed his rations in a very new way, and we have been eating peanut butter and jelly sandwiches for sixty years. In the century following the introduction of Concord grapes, more of these purple slip-skin grapes were sold than all other species combined. Today, growers harvest more than 336,000 tons in the U.S. Washington State grows the largest number, followed by New York, Michigan, Pennsylvania, Ohio and Missouri.